Blick Premier Cotton Canvas represents our highest standards of quality and excellence. Every canvas is made by hand to our precise specifications to ensure a superior painting experience for the artist — as well as maximum archival stability and durability. From the hand-woven, top-grade fabric to the meticulous priming and stretching by hand, supreme care and craftsmanship are taken with every step of their fabrication. 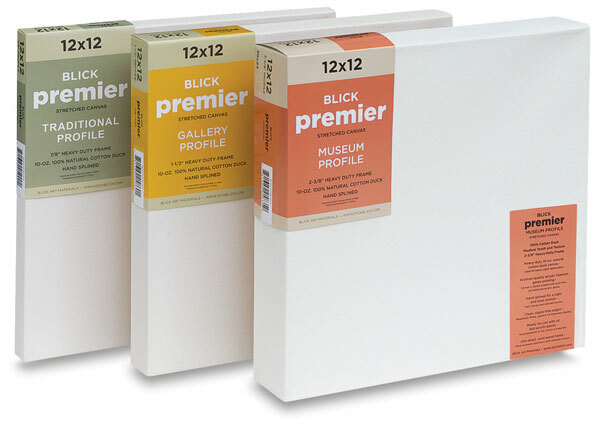 We invite you to compare Blick Premier Cotton Canvas to the world's leading brands, and we think you'll agree the only difference between ours and theirs is the affordable price. How is the canvas made? First, the cotton duck is grown and woven in India. Then the canvas is coated with three layers of professional-grade, acid-free gesso. It’s carefully sanded between primer coats for a smooth, luxurious surface with just the right tooth. 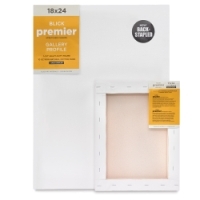 Finally, the primed fabric is evenly stretched around Blick Premier solid wood stretcher bars, which are kiln-dried for warp-resistance and long-term stability. Larger canvas sizes are braced for extra support. Cross brace configurations may vary by size and style. Back-Stapled Cotton Canvas — Gallery-wrapped and back-stapled with uncut corners and generous selvage, allowing for future re-stretching if desired. Keys are included for tension adjustments over time. Splined Cotton Canvas — Hand-splined on the back with minimal staples and no bulky corner folds. A rubber gasket holds the fabric neatly in place. Splined canvases hang tight to the wall and are often preferred by artists who display their work unframed.